In a Nutshell: Many believe that wealth management is only for the super affluent, but some of the strongest portfolios are those that start small and grow over the long term with the help of professionals. 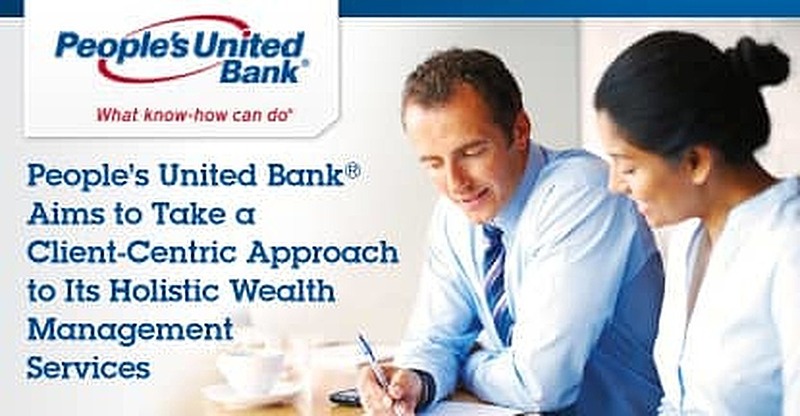 Among its other traditional banking offerings, New England-based People’s United Bank has wealth management services where its professionals work closely with clients on all parts of the wealth spectrum. Focusing on each client’s specific situation and needs, People’s United tailors a blueprint to reach your ultimate goal, while looking out for future roadblocks. With a move toward incorporating future technology and robo-advising, People’s United is poised to continue its role as a trusted source for growing wealth of all sizes. For most people, the term “wealth management” is synonymous with the ultra wealthy. Images of accountants, investment firms, and tax attorneys probably come to mind. This might be because some wealth managers’ websites tout their services for potential high-net-worth clientele. While affluent clients might be more likely to use wealth management services because they have more money to manage, many others never look into wealth management for their own nest eggs. The idea that you have to have millions of dollars to consider these services often leaves investable money sitting in low-yield savings accounts instead of working to get you closer to your ultimate goals. In many cases, it’s the non-mega wealthy that feel they should forgo the services of a professional trust and investment provider. People’s United Wealth Management, an arm of People’s United Bank, looks to bridge that gap and put your money to work for you. As the largest independent regional banking organization headquartered in New England, People’s United has more than $23 billion in combined AUM and AUA and more than 5,000 employees spread across 400 branches. As a bank, People’s United’s wealth management services are a logical extension of its 175-year history of working with individuals and businesses to help them achieve their financial objectives. While Darst said that a majority of the company’s clients have investable assets between a half million dollars to $10 million, he said there are products in place for clients in all stages of wealth building. People’s was founded as a bank in Bridgeport, Connecticut, in 1842, and its trust and investment departments have been working with clients for decades. That experience has helped the company create a clear picture of what wealth management should be from the early stages of asset allocation until the final stages of retirement. Through the company’s website, several options exist for opening accounts with its wealth management team. The first step is to set up an appointment to speak with one of the company’s wealth and investment officers. That can be done through one of the many branches in the northeast area of the United States, or over the phone or online. Darst said that this is the first step in the company’s overall goal in building a relationship with its clients that lasts well into retirement. That involvement starts with learning where you are currently in your financial journey, what your objectives are, and what motivates you. Darst says the company then can create a blueprint or plan that can help you move forward toward your financial goals. “Our objective is to do what’s right for the customer,” Darst said. “We seek to be a trusted advisor, able to bring solutions for multi-generational planning, to work with your lawyers and attorneys as a trust administrator, as an investment manager, as a banker. We bring together the expertise needed for each customer to help solve for their preferred outcomes. While some clients will trust their manager wholeheartedly with their funds, and not check in on them until quarterly statements are mailed, Darst said most want to know where their money is going and what it’s doing. A large number of modern investors put that trust in their advisor to not only look at the bottom-line financials of a company, but to dig deeper to find out the core values of a firm before money is invested. People’s United Bank uses strategical insights to help clients make informed investment decisions. This ESG approach looks at what a company does beyond its boardroom and filters its worthiness of investment based on social ramifications. In other words, a company’s stance on major issues determines if they’re worthy of your hard-earned dollar. Darst says that People’s United has provisions in place to closely examine the ESG of a company before pulling the trigger on an investment. Wherever stage you are at in life, there is always possibility for change. A good money management team can help protect you from the what-ifs that life brings along, whether it be changing tax brackets, adding to your family, starting a business, taking minimum withdrawals from retirement, or experiencing a decline in health. While declining health certainly isn’t anyone’s plan, there are also strategies in place that can help customers reach goals of opening a business, or just maximizing their income for retirement, no matter how far away that may be. Risk is something that must be thought out thoroughly before approaching a wealth manager. Depending on your stage in life, the amount of risk you’re willing to take on will dictate how your investments are made and where the funds are placed. It’s always a good idea to keep an eye on your money, no matter if you’re investing it yourself or you’ve hired someone to manage it for you. If you’ve chosen the latter, the relationship and trust you’ve built with your manager is important. To help give some power back to the investor, People’s United is working to increase its digital offerings through robo-investing and algorithms to automate asset management. It’s something that the company never dreamed of in 1842, but with the progression of the digital age, People’s United is using technology to stay competitive. People’s United prioritizes customer relationships to foster lifelong connections with clients. “Our bank has made a move to move prudently, but with some speed, into more digital engagement with our clients,” Darst said. People’s United aims to meet the needs of all types of clients, from those looking to do all of their banking and investing digitally, to those who prefer to enter a branch and work face-to-face with an advisor, and those who prefer a hybrid of the two. It’s that spectrum that can be both broad and intimidating. Too often, people don’t consider money management in their personal finances, deterred by thinking it’s only for those with high net worth. With a little research, investors with any sized savings can find a way to grow their net worth and see their dreams come to fruition.